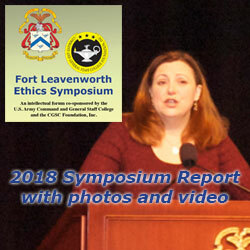 Ninth annual ethics symposium report | Command and General Staff College Foundation, Inc.
Dr. Shannon E. French, the CGSC Foundation’s General Hugh Shelton Distinguished Visiting Chair of Ethics, delivers the 2018 Fort Leavenworth Ethics Symposium closing keynote address May 1, 2018. Dr. George R. Lucas, Jr., Professor of Ethics (Emeritus), U.S. Naval Academy, delivers the opening keynote address for the Fort Leavenworth Ethics Symposium on April 30. 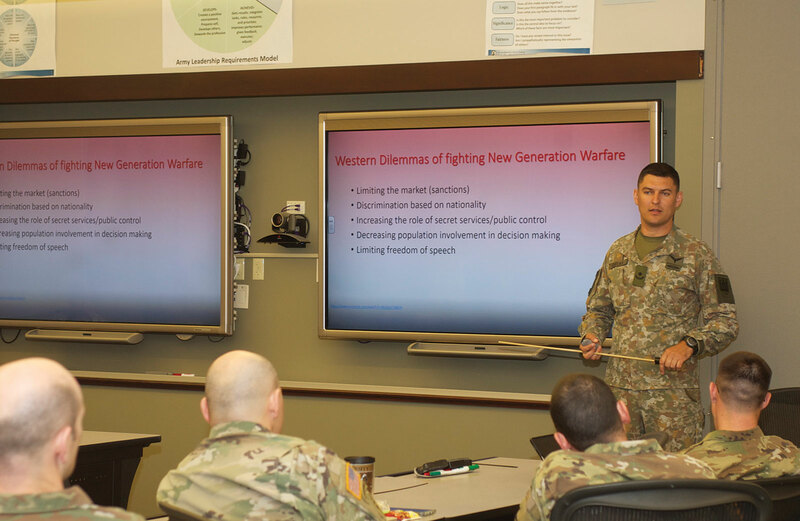 Maj. Egidijus Cuitas, an international military student in the current CGSOC class, presents his award-winning paper during a breakout session at the 2018 Fort Leavenworth Ethics Symposium. His paper entitled “Criminal Ethos of Russia – The Great Western Dilemma of Fighting New Generation Warfare” was one of two selected as the top papers for the symposium. 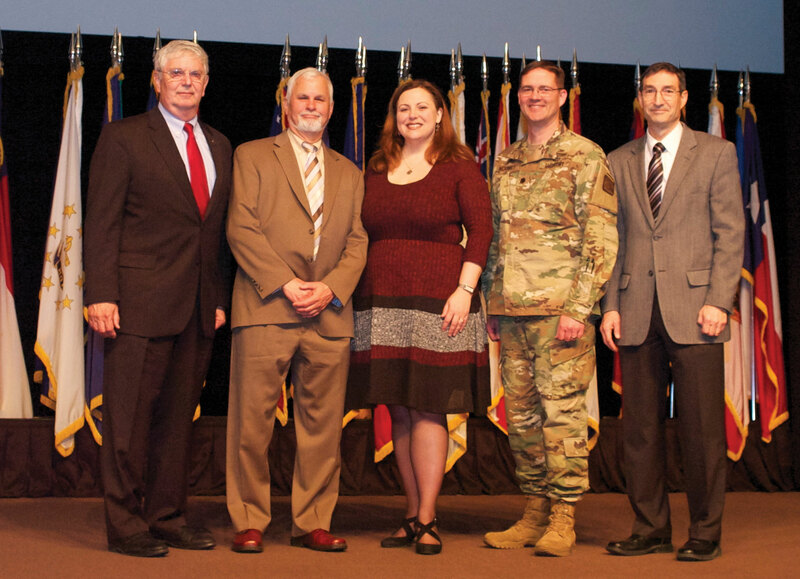 Organizers and keynote speakers for the 2018 Fort Leavenworth Ethics Symposium, from left: Doug Tystad, President/CEO of the CGSC Foundation; Dr. George Lucas, Jr., keynote speaker; Dr. Shannon E. French, closing keynote speaker; Chaplain (Lt. Col.) Jeff McKinney, CGSC lead project officer for the symposium; and Dr. Ted Thomas, director of CGSC Department of Command and Leadership. This ninth annual symposium featured a variety of guest speakers, panel presentations and breakout topics. CGSC Deputy Commandant Brig. Gen. Scott L. Efflandt delivered welcoming remarks on the morning of April 30, followed by the opening keynote speaker, Dr. George R. Lucas, Jr., Professor of Ethics (Emeritus), U.S. Naval Academy. The closing guest speaker on May 1 was Dr. Shannon E. French, the CGSC Foundation’s General Hugh Shelton Distinguished Visiting Chair of Ethics, and director of the Inamori International Center for Ethics and Excellence. 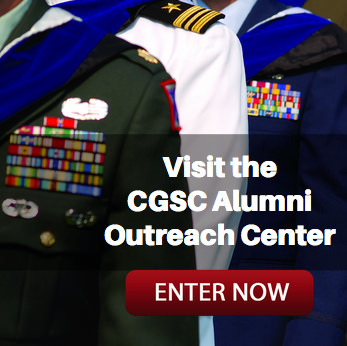 More than 1,000 members of the Command and General Staff Officers Course (CGSOC) along with guests and visitors participated in the ethics conference that featured a variety of guest speakers, three panel presentations and over thirty breakout topics. More than 50 papers were submitted for discussion at the symposium, of which 34 were selected to be presented during breakout sessions. At the end of the symposium awards were presented to the two top papers among those 34: “Criminal Ethos of Russia – The Great Western Dilemma of Fighting New Generation Warfare” by Maj. Egidijus Cuitas, an international military student in the current CGSOC class, and “What were you thinking? 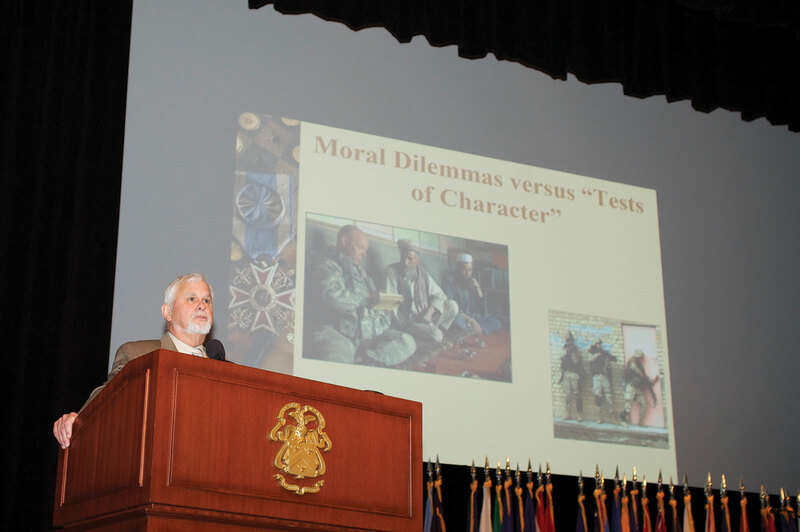 How to discover your moral philosophy: A Forensic Approach,” by Dr. Richard McConnell, a CGSC professor, and Maj. Evan Westgate, a U.S. Army officer-student in the current class. Lucas explained that in the military environment this “moral dilemma” may involve uncertainly or disagreement on applying specific rules of engagement or the broad moral conceptions of just and unjust warfare. “These are profound and perplexing problems about which reasonable and well-intentioned people can disagree,” he said. By contrast, he added that, “tests of character” are simply those scandals or situations that typically find their way into our “ethics training.” The tests of character are simple questions of right and wrong. That’s the kind of situation that causes the sort of ethics training we typically face. “Ethics is not tests of character, but genuine moral dilemmas that you face in the pursuit of your professional responsibilities in uniform,” he said. 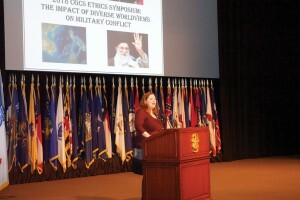 In the symposium’s closing keynote, standing in front of a graphic depicting North Korea, Russia, Iran, and the South China Sea Dr. Shannon E. French, the CGSC Foundation’s General Hugh Shelton Distinguished Visiting Chair of Ethics, asked the audience “What kind of person do you want to be and why?” The natural follow-up, she said, is how do you become that person and retain that identity? After reminding her audience “Everyone is capable of doing anything,” she shared with them some ways to prepare for coming ethical crises. First, she said, figure out who you can trust – friends and mentors. Secondly, learn what can interfere with making the ethical choice – avoid false dilemmas. Thirdly, develop the ability to shift between different kinds of tasks. And last, learn the stories of people who have made the right decision. As an example of the last, she told several stories of Saladin, leader of the Muslim tribes during the crusades, making ethical decisions. This included allowing the survivors of Jerusalem to depart rather than slaughtering the inhabitants as had been done when Christian forces took the city from the Muslims years earlier. The Culture, Regional Expertise and Language Management Office (CRELMO) put together what most considered an outstanding panel on North Korea. Three internationally known Korea experts and one subject matter expert from CGSC talked about one of the hottest topics of the day. 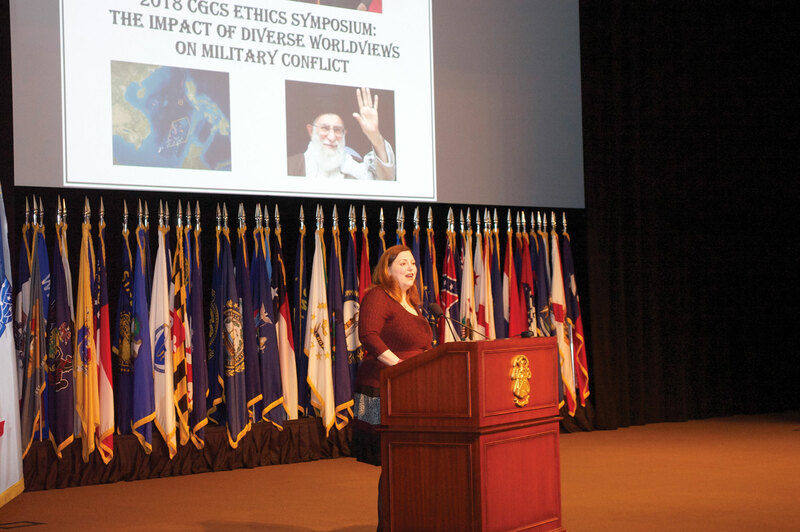 The Fort Leavenworth Ethics Symposium is an annual symposium co-sponsored and hosted by the U.S. Army Command and General Staff College (CGSC) and the Command and General Staff College Foundation, Inc., through a generous grant by the Perot Foundation. For more photos from the symposium visit the albums on the CGSC Foundation Flickr site and the CGSC Public Affairs Flickr site. 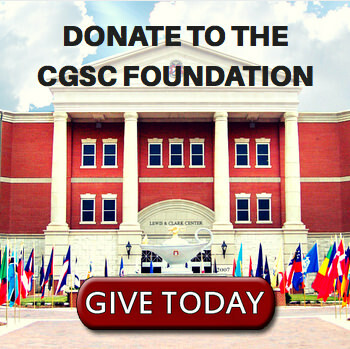 The videos are posted on the CGSC Foundation’s YouTube site.